Fiction – paperback; Sceptre; 544 pages; 2005. 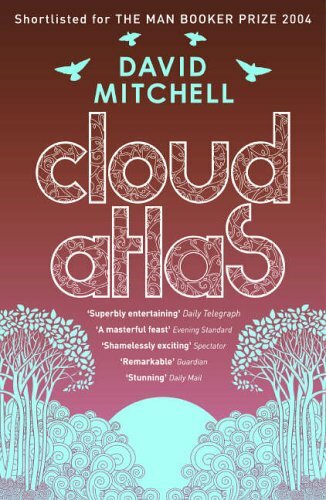 Out of all the recommendations I have received from fellow book bloggers over the past few years, David Mitchell’s Cloud Atlas gets mentioned more than any other book. It has been lauded by so many people I was almost too scared to read it, which is why it languished in my ever-growing to-be-read pile for more than three years. When I finally worked up the courage to read it, I have to be brutally honest and say I could not work out what all the fuss was about. The Pacific Journal of Adam Ewing — a 19th century seafaring novella very much in the vein of Matthew Kneale’s English Passengers and Richard Flanagan’s Gould’s Book of Fish, right down to the use of ampersands throughout. Letters from Zedelghem — set in the 1930s, this tells the story of an English con artist who moves to Belgium and ingratiates himself with a reclusive composer and his family. It reads like a pre-war novel and has some raunchy romance thrown in for good measure. Half-Lives: The First Luisa Rey Mystery — a fast-moving industrial espionage type thriller set in 1970s America, it reminded me a little of John Grisham’s The Firm. The Ghastly Ordeal of Timothy Cavendish — set in England in the late 20th century, it throws a nod to P.G. Wodehouse, as it is essentially a comedy of manners in which a 60-something editor gets mistakenly locked up in an old people’s home from which he cannot escape. An Orison of Sonmi — an eerie science fiction thriller about clones, I found this bit the most intriguing (and moving) story in the entire novel, reminding me a little of Kazuo Ishiguro’s Never Let Me Go. Sloosha’s Crossin’ an’ Ev’rythin’ After — this is set in the future after the science and technology is long gone, leaving behind a world in which even the language is corrupted and humankind must eke out a very primitive existence. By its very nature, the diverse range of genres presented here means that the reader will find some chapters more enjoyable than others. I definitely preferred the two thrillers — the espionage one and the science fiction one — which is generally indicative of my reading tastes, while I thoroughly struggled with the futuristic one written in a kind of pidgin English that bored me and confused me in equal measure. And that, I guess, is my major gripe with this novel. It works in parts but not as a whole. I was left with the impression that Cloud Atlas is a writer’s book, not a reader’s one, because it felt like a succession of literary stunts — for the sake of it. If Mitchell was a pastry chef, I imagine he wouldn’t be happy just creating the dessert: he’d want to create Michelin-star four-course meals as well, if only to prove he could do it. Not that there is any doubt that Mitchell can write — the six interlinked stories here are quite extraordinary examples of his ability to switch genres and time periods with relative ease. However,in my opinion, it felt like he was showing off. As much as I pride myself on seeking out different genres to read and trying books set in vastly different times and places, I don’t necessarily want to experience these all in the one novel. If I want to read a seafaring story, I’ll read one. Ditto for a thriller. I devoted two days to Cloud Atlas while on a recent holiday in the sun, time that I will never get back. Before you all jump up and down and leave me abusive comments, I’m not saying that I completely hated the book. I simply found it hard work, and perhaps it was not best suited for a lazy beach read, something to bear in mind if you’re considering packing it in your suitcase any time soon. A worthy read, yes, an enjoyable one, so-so. And while Mitchell fans may disagree, I’d prefer Black Swan Green over this any day. I agree with you about not being a beach book. I had to draw a diagram to understand what was going on! Bah – didn’t like it so didn’t pass the first 20 pages test so you’re not alone. I find it really hard to like literary novels. The exception being David Leavitt – Martin Bauman – who created a book that made me almost cry when I reached the end as there would be no more. I have yet to read Cloud Atlas, and it is for reasons similar to those you outline in your post. Having said that I have really enjoyed Mitchell’s other work, which I came to through BSG, which is a great entry into the “damaged” boy as narrator school of novel. Ghostwritten and Number Nine Dream are also works that match the reputation. Don’t you think he’s making the point that good fiction, is good fiction, whatever the genre – it’s all linked together? I enjoyed the book and seeing how he got all the conections in there. Although, as you’ve mentionned Snow, I do think that that’s a better read. I have BSG on my TBR shelf, so more good news for me on that count. I recommended it too, sorry. I loved the way the stories were told in 2 parts, and you had to wait to find out the conclusion to each, and found it incredibly moving. PS. I also read the new Nicci French, SO much better than Losing You. I think a local New Zealand reviewer got this novel dead write: lots of pyrotechnics but when it comes down to it, there was a hollow “so what” feeling when the show was over. Of course, he is a master stylist, and I do respect that (I am a Joyce fan after all) but it all seems a bit wasted on a fairly simplistic moral: we’re doomed. I found it enjoyable (also read it on a holiday), but nothing amazing. Nice cover though. I agree that Cloud Atlas is probably less than the sum of its parts. Nonetheless, those parts are very impressive, and much of your review goes to indicate that you CAN see what all the fuss is about … you just don’t agree with it! For me the best stories were Letters… and Ghastly Ordeal…, perhaps because they were the funniest. I also enjoyed spotting all the references to Philip Larkin’s poems in the latter, though that may just go to show that I am the sort of literary masturbator that Mitchell was aiming his work at!